Indoxyl sulfate and p-cresol sulfate have been suggested to induce kidney tissue remodeling. This study aimed to clarify the molecular mechanisms underlying this tissue remodeling using cultured human proximal renal tubular cells and half-nephrectomized mice treated with indoxyl sulfate or p-cresol sulfate as study models. 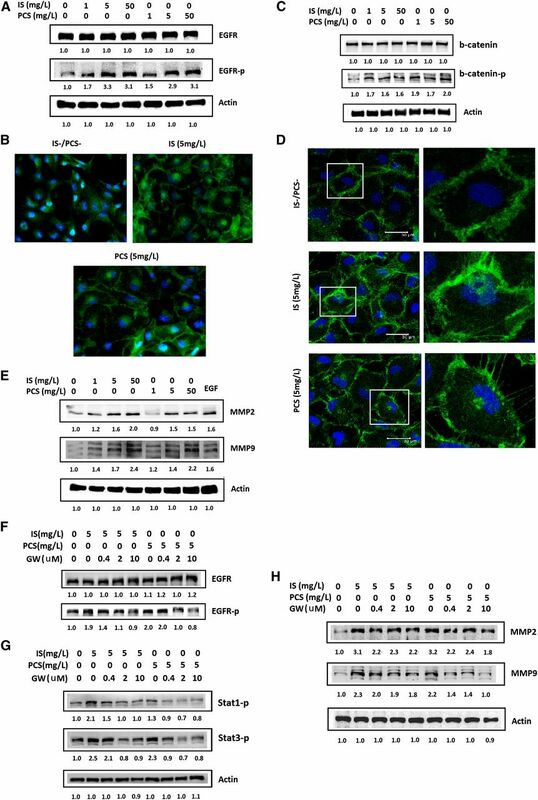 Molecular docking results suggested that indoxyl sulfate and p-cresol sulfate dock on a putative interdomain pocket of the extracellular EGF receptor. In vitro spectrophotometric analysis revealed that the presence of a synthetic EGF receptor peptide significantly decreased the spectrophotometric absorption of indoxyl sulfate and p-cresol sulfate. In cultured cells, indoxyl sulfate and p-cresol sulfate activated the EGF receptor and downstream signaling by enhancing receptor dimerization, and increased expression of matrix metalloproteinases 2 and 9 in an EGF receptor–dependent manner. Treatment of mice with indoxyl sulfate or p-cresol sulfate significantly activated the renal EGF receptor and increased the tubulointerstitial expression of matrix metalloproteinases 2 and 9. In conclusion, indoxyl sulfate and p-cresol sulfate may induce kidney tissue remodeling through direct binding and activation of the renal EGF receptor. The renal toxicity induced by uremic toxins is thought to have a specific pathologic role in renal disease progression. Indoxyl sulfate (IS) and p-cresol sulfate (PCS) are protein-bound uremic toxins that are not dialyzable.1 Several pathologic mechanisms such as oxidative stress, inflammatory reaction, and renin-angiotensin-aldosterone system activation have been proposed to contribute to chronic kidney injury induced by IS and PCS.2,3 Animal studies have indicated that IS and PCS cause renal fibrosis.3 Pathologic tissue remodeling has been suggested to have a detrimental role in the tissue fibrosis. The matrix metalloproteinases (MMPs) play an important role in tissue remodeling associated with various physiologic and pathologic processes. MMPs can act on a wide range of extracellular matrix proteins.4 EGF receptor (EGFR) and its signaling cascade activation have crucial roles in enhancing MMP expression and function in organogenesis and cancer development.5,6 Evidence indicates that IS and PCS induce tissue remolding in vivo.3,7 However, the molecular mechanism underlying the tissue remodeling induced by IS and PCS is still unknown. 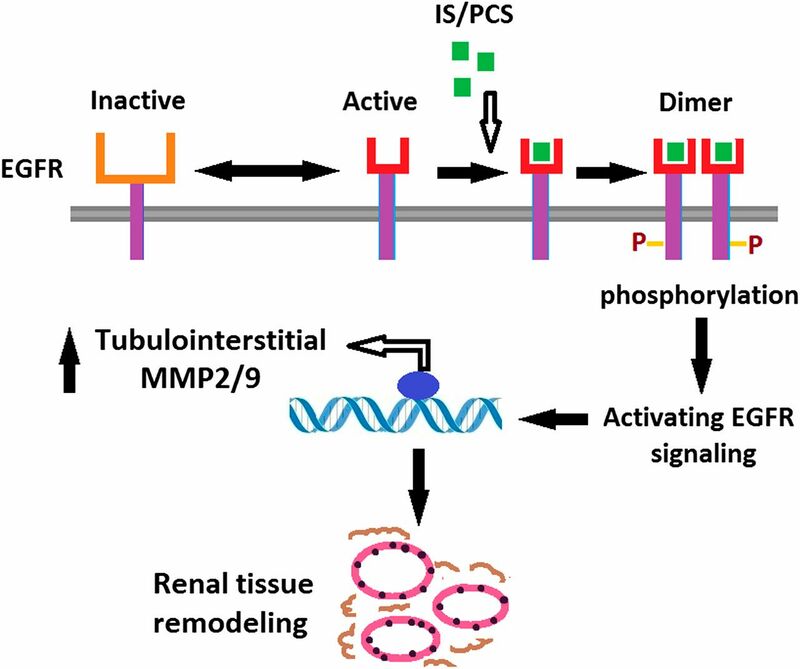 This study aimed to find the putative pathologic linkage between the protein-bound uremic toxins, EGFR, and MMPs to clarify the molecular mechanism underlying renal tissue remolding induced by IS and PCS. The functional domains of EGFR are illustrated in Figure 1A. Two EGFR structure templates, active (Protein Data Bank entry code 1IVO)8 and inactive (Protein Data Bank entry code 1NQL),9 were used for molecular simulation and docking. Utilizing molecular simulation, a putative interdomain pocket of active EGFR (1IVO), which is located just beneath the EGF binding site, was identified (Figure 1B). The docking analysis indicated that IS and PCS could dock in the interdomain pocket of active EGFR (1IVO) (Figure 1, C and D). However, the conformation of the interdomain pocket of inactive EGFR (1NQL) was significantly different from that of active EGFR (1IVO). Protein superimposition revealed that the structures of the interdomain pocket were different between 1NQL and 1IVO (Figure 1, E and F). The docking analysis demonstrated that IS and PCS failed to target the interdomain pocket of inactive EGR (1NQL) (Figure 1, G and H). To evaluate whether IS and PCS interacted with EGFR in vitro, light absorption of IS and PCS in the presence or absence of synthetic extracellular EGFR peptide (amino acids 25–645) was analyzed. The results indicated that the presence of EGFR (10 µM) significantly decreased the OD of IS (50 mg/L) and PCS (50 mg/L) (Figure 1I). The effects of IS and PCS on the EGFR dimerization were tested in vitro by incubating IS, PCS, and synthetic EGFR peptide. Silver staining indicated that EGFR dimer increased as the concentrations of IS and PCS were increased in vitro (Figure 1J). The effects of IS and PCS on the EGFR dimerization were tested in HK2 cells. The Western blot results indicated that IS and PCS treatment increased the dimer formation of EGFR in a dose-dependent manner (Figure 1K). Previous studies suggested that interactions between the extracellular domains of EGFR were important for the stability of EGFR.9,10 It was suggested that IS and PCS might stabilize the active structure of EGFR and facilitate EGFR dimerization. Molecular simulation of EGFR docking and targeting analysis in vitro. (A) Illustration of functional domains of EGFR (modified from Ferguson10). (B) Molecular simulation of EGFR structure adopted from active EGFR (1IVO). The interdomain pocket of EGFR is highlighted. (C) Representative plot of IS targeting the interdomain pocket of active EGFR (1IVO). (D) Representative plot of PCS targeting the interdomain pocket of active EGFR (1IVO). (E) Molecular simulation of EGFR structure adopted from inactive EGFR (1NQL). (F) Superimposition of 1IVO (yellow) and 1NQL (red). (G) Representative plot of potential docking site of IS on inactive EGFR (1NQL). (H) Representative plot of potential docking site of PCS on inactive EGFR (1NQL). The white arrow indicates the potential docking sites of IS and PCS. (I) In vitro spectrophotometric analysis of the interactions between IS, PCS, and recombinant human EGFR peptide (amino acids 25–645) with light spectrum ranging from 200 to 400 nm. Histograms of the absorbent density of IS (OD 240) and PCS (OD 270) at a concentration of 50 mg/L are plotted. The concentration of IS, PCS, and synthetic EGFR, and the reaction conditions are shown. The absorbance of PBS is used as the blank. (J) Silver staining results of the EGFR dimerization in vitro analysis. IS, PCS, and synthetic extracellular EGFR peptide are reacted at room temperature for 12 hours. The final reactants are treated with glutaraldehyde to facilitate protein cross-linkage. EGFR dimerization increases with the increase in the concentration of IS and PCS. (K) EGFR dimerization in HK2 cells. Western blots are performed on the cells with or without IS and PCS treatment in a serum-free condition for 24 hours. The final lysate from each reaction is treated with glutaraldehyde to facilitate protein cross-linkage. Western blot analysis indicated that IS and PCS significantly increased EGFR phosphorylation in vitro (Figure 2A). Immunofluorescence staining showed that IS and PCS treatment significantly increased the membrane localization of EGFR in cultured HK2 cells (Figure 2B). In addition, IS and PCS significantly increased the phosphorylation of β-catenin (Figure 2C) and the nuclear localization of β-catenin (Figure 2D). Our results indicated that IS and PCS increased MMP2 and MMP9 expression in a dose-dependent manner in HK2 cells (Figure 2E). We also performed the Western blotting and activity analysis for MMP2 and MMP9 with culture medium of HK2 cells after 4-day IS, PCS, and EGF treatment. The study results showed that the culture medium of cells treated with IS and PCS had significantly increased MMP2 and MMP9 activities (Supplemental Figure 1). IS and PCS activates EGFR and increases MMP2 and MMP9 expression in vitro. (A) Western blotting images of EGFR and EGFR-p in HK2 cells treated with IS/PCS for 24 hours. (B) Results of immunofluorescence staining with anti-EGFR in HK2 cells treated with IS/PCS at a concentration of 5 mg/L for 24 hours (confocal microscopy). (C) Western blotting images of β-catenin and β-catenin-p in HK2 cells treated with IS/PCS for 24 hours. (D) Results of immunofluorescence staining with anti-β-catenin in HK2 cells treated with IS/PCS at a concentration of 5 mg/L for 24 hours (confocal microscopy). (E) Western blotting images of MMP2 and MMP9 in HK2 cells treated with IS/PCS for 24 hours. HK2 cells treated with EGF (1 ng/ml) are used as a positive control. (F) Western blotting images of EGFR and EGFR-p in HK2 cells treated with IS/PCS in the presence or absence of GW2974 for 24 hours. The amount of EGFR is used as a control. (G) Western blotting images of Stat1-p and Stat3-p in HK2 cells treated with IS/PCS in the presence or absence of GW2974 for 24 hours. (H) Western blotting images of MMP2 and MMP9 in HK2 cells treated with IS/PCS in the presence or absence of GW2974 for 24 hours. The concentrations of reactants are illustrated. GW, GW2974. Original magnification, ×400 in B; ×600 in D.
To test whether EGFR activation by IS and PCS was associated with increased expression of MMP2 and MMP9, an in vitro study was performed with EGFR inhibitor (GW2974) treatment. Inhibiting EGFR with GW2974 could significantly suppress EGFR phosphorylation, which was induced by IS and PCS in vitro (Figure 2F). GW2974 treatment decreased Stat1 and Stat3 phosphorylation induced by IS and PCS (Figure 2G). It was also noted that inhibition of EGFR attenuated the effects of IS and PCS on MMP2 and MMP9 expression in vitro (Figure 2H). The in vitro studies also showed that EGFR activation by EGF could be augmented in the presences of IS and PCS. Co-treatment with EGF (1 ng/ml) and IS/PCS significantly increased the MMP2 and MMP9 expression compared with the cells treated with EGF along (Supplemental Figure 2). IS and PCS are the albumin-bound uremic toxins. In vitro experiments in the presence of albumin were performed. 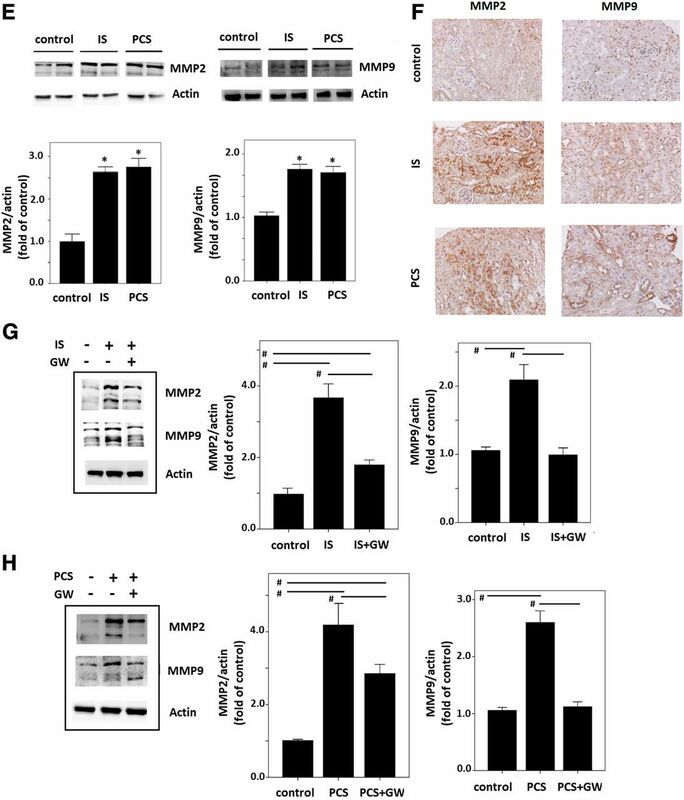 The study results showed that the presence of albumin in the culture medium significantly lessened the EGFR activation and attenuated the effects of IS and PCS on MMP2 and MMP9 expression (Supplemental Figure 3). The animal study results showed that treatment with IS or PCS significantly activated EGFR signaling by increasing the EGFR-p, Erk1/2-p, and Akt-p expression in the kidney of mice (Figure 3A). 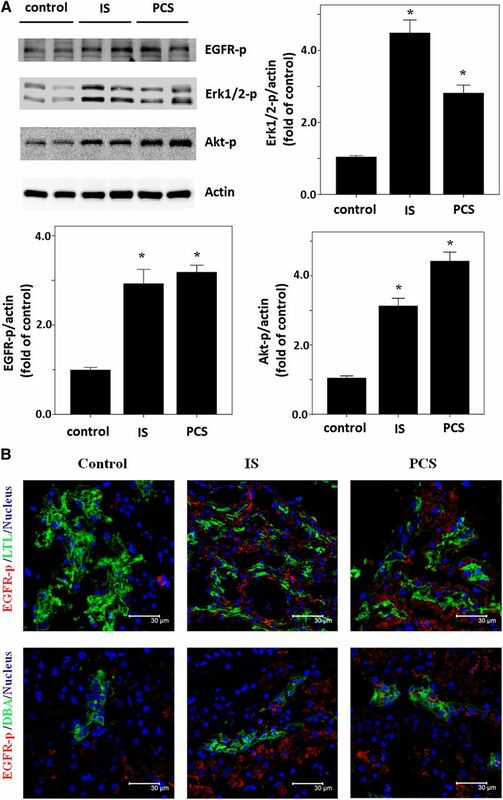 Immunofluorescence staining for EGFR-p and tubular markers showed that EGFR-p was stained strongly in the tubulointerstitium of mice treated with IS and PCS. In mice treated with IS and PCS, EGFR-p was predominately located in the proximal tubule segments that were positive for Lotus tetragonolobus lectin staining. EGFR-p was also found in tubular cells with positive Dolichosbiflorus agglutinin staining, which was a marker for collecting ducts (Figure 3B). Western blot results revealed that IS or PCS treatment significantly increased the expression of β-catenin-p in the mice (Figure 3C). In addition to the membrane and cytoplasmic localization of β-catenin, immunohistochemistry staining results indicated that IS and PCS significantly increased the nuclear localization of β-catenin in the tubular cells of the mice (Figure 3D). Western blotting results indicated that the study mice treated with IS and PCS significantly increased renal MMP2 and MMP9 expression (Figure 3E). Immunohistochemistry analysis indicated that IS and PCS treatment significantly increased positive tubulointerstitial staining for MMP2 and MMP9 in mice treated with IS and PCS (Figure 3F). The results of EGFR inhibition study indicated that GW2974 treatment significantly attenuated the increase of MMP2 and MMP9 expression by IS and PCS in vivo (Figure 3, G and H). IS and PCS activates EGFR signaling in vivo. (A) Western blotting results for EGFR-p, Erk1/2-p, and Akt-p in control mice (n=8) and in experimental mice treated with IS (n=8) and PCS (n=8). (B) Representative results of immunofluorescence staining for EGFR-p and tubular markers (LTL and DBA) in control and experimental mice (confocal microscopy). (C) Western blotting results of β-catenin-p in control and experimental mice (n=8 for each group). (D) Representative results of immunohistochemistry staining for β-catenin-p in control and experimental mice (light microscopy). (E) Western blotting analysis for MMP2 and MMP9 in control and experimental mice (n=8 for each group). (F) Representative results of immunohistochemistry staining for MMP2 and MMP9 in control and experimental mice (light microscopy). (G) Western blotting analysis of MMP2 and MMP9 in mice treated with IS with or without GW2974 (n=8 for each group). (H) Western blotting analysis of MMP2 and MMP9 in mice treated with PCS with or without GW2974 (n=8 for each group). *P<0.05 versus control for A, C, and E; #P<0.05 for G and H. GW, GW2974. Original magnification, ×3600 in B; ×3400 in D; ×3200 in F. DBA, Dolichosbiflorus agglutinin; LTL, Lotus tetragonolobus lectin. The study results are summarized in Figure 4. EGFR activation has been shown to contribute to the development and progression of renal fibrosis.11,12 Our results suggested that protein-bound uremic toxins IS and PCS might target EGFR. Hydrophobic interactions between IS/PCS and EGFR might facilitate EGFR dimerization and activate EGFR signaling. The activated EGFR signaling could increase the tubulointerstitial expression of matrix proteases MMP2 and MMP9, which are involved in tissue remodeling. It has been known that organic anion transporters are responsible for transporting IS and PCS into the cells. The intracellular localization of IS and PCS plays a critical role in mediating the toxic effects of IS and PCS. Inhibiting the IS and PCS transportation by organic anion transporters could minimize the cellular toxicity of IS and PCS.13,14 Our data further clarified the molecular mechanism underlying the cellular toxicity of IS and PCS. Our study suggested that the cellular toxicity of IS and PCS could be mediated by an alternative pathway other than the organic anion transporters. Direct targeting and activation of cytokine receptors might be considered as a potential alternative pathologic pathway. Schematic of IS- and PCS-related tissue remodeling. The conformations of EGFR change dynamically in cells. IS and PCS might target the interdomain pocket of active EGFR by stabilizing the structure of active EGFR and inducing the EGFR dimerization. Activated EGFR might increase MMP expression directly or by its downstream signaling factors. The increased MMPs might augment tissue remodeling observed in kidney injury induced by IS and PCS. The mechanisms associated with EGFR activation are complicated, and currently are not completely understood. Ligand-driven dimerization and intermolecular allosteric activation of EGFR are the main mechanisms.10,15 It is proposed that monomeric EGFR is in equilibrium with active and inactive receptor oligomers in the cell membrane.15,16 This study suggested that IS and PCS might target the extracellular interdomain pocket of active EGFR, but not inactive EGFR. 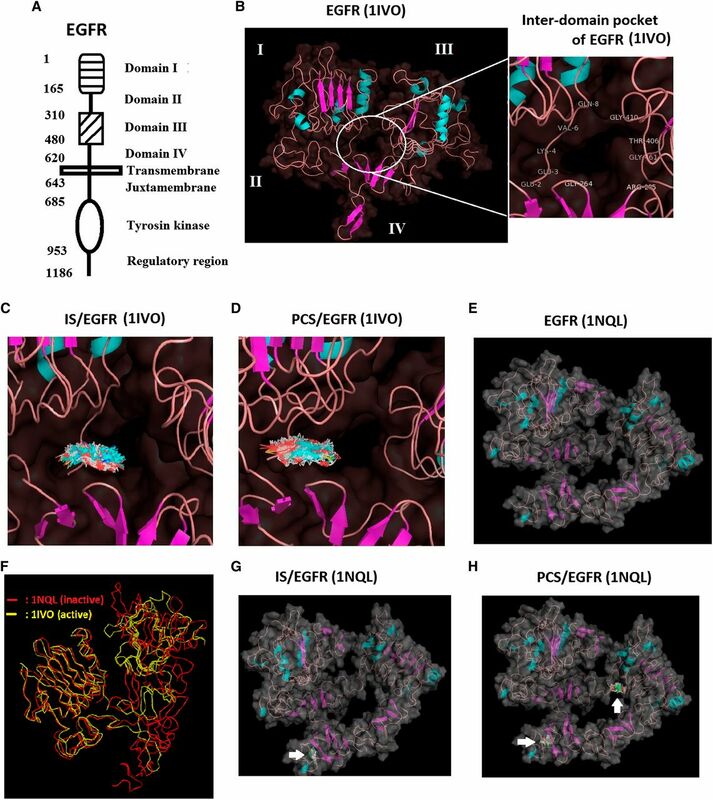 It has been shown that extracellular domain II is important for the receptor-mediated dimerization of EGFR.8 Intramolecular interactions between the extracellular domains are important for maintaining EGFR active structure. Mutations that disrupt the intramolecular domain II/IV interaction might increase EGF binding affinity.9 It has been reported that the interaction between domains II and III could play a significant part in maintaining EGFR in the extracellular region in an inactive conformation.17 Our data indicated that IS and PCS could bind with the extracellular portion of EGFR. Furthermore, in vitro studies also showed that IS and PCS could increase the dimerization and activation of EGFR. Our data suggest that binding of IS and PCS with extracellular portion of EGFR might stabilize the active EGFR structure, which in turn promotes EGFR dimerization and phosphorylation. Accumulated evidence indicated that EGFR activation might contributes to development and progression of renal diseases in animal models of CKD. Activation of renal interstitial fibroblasts, induction of tubular atrophy, overproduction of inflammatory factors, and promotion of glomerular injury by EGFR activation have been proposed as the possible pathologic mechanisms for chronic kidney injury.18 Recent studies also indicated that EGFR activation is essential for the upregulation of renal fibrotic genes by TGF-β1.19 Epithelial–mesenchymal transition of renal tubular cells was proposed as a possible mechanism for the renal fibrosis induced by IS and PCS.3 Recent evidence indicated that MMPs are implicated in the initiation and progression of renal fibrosis. MMP2 and MMP9 can induce renal tubular cell epithelial–mesenchymal transition in vitro.20,21 Previous studies had revealed that MMP expression is induced by EGFR signaling.22 Our results showed that IS and PCS could activate signaling of EGFR, Akt, and Erk1/2 in study mice. It was reported that EGFR activation and subsequent tyrosine phosphorylation of β-catenin contribute to the activation and nuclear translocation of β-catenin.23 Nuclear β-catenin could activate β-catenin target genes such as MMP2 by histone H3 and H4 acetylation.24 The results of our study indicated that IS and PCS stimulated β-catenin phosphorylation and increased its nuclear localization in vitro and in vivo. It can be suggested that activation and nuclear translocation of β-catenin by EGFR signaling is an important pathway to facilitate tubulointerstitial MMP expression by IS and PCS. In conclusion, our study suggested that direct targeting and activation of cytokine receptors by protein-bound uremic toxins might be a potential pathologic pathway other than the injury mediated by organic anion transporters. Activation of EGFR by IS and PCS could contribute to renal tissue remodeling by increasing MMP2 and MMP9 expression. Recombinant human EGFR (amino acids 25–645; PeproTech, Rocky Hill, NJ), comprising the extracellular domain of EGFR, was dissolved in PBS at a concentration of 10 µM, and incubated with IS (Sigma-Aldrich, St. Louis, MO) and PCS (Kureha, Tokyo, Japan) at room temperature for 30 minutes in the dark. The experimental conditions and reagent concentrations utilized for the spectrophotometric analysis are shown in the figure legends. Samples were analyzed in the 200- to 400-nm wave length range (SpectraMax M3; Molecular Devices LLC, Sunnyvale, CA). HK2 cells were cultured as previously reported.28 HK2 cell cultures at 70% confluence were synchronized under serum-free conditions for 4 hours. The HK2 cells under the serum-free condition were then treated with IS or PCS at concentrations of 0, 1, 5, and 50 mg/L for 24 hours. For EGFR inhibition experiments, GW2974 (Sigma-Aldrich), a potent and selective dual inhibitor of EGFR and ErbB-2 receptor tyrosine kinase,29 at concentrations of 0, 0.4, 2, and 10 µM were added to HK2 cells 2 hours before IS and PCS treatment. The recombinant human EGFR was incubated with IS and PCS at concentrations of 0, 1, 5, and 50 mg/L in PBS at room temperature for 12 hours in the dark. When the incubation was completed, the reaction mixtures (100 µl) were treated with 5 µl of 2.3% freshly prepared solution of glutaraldehyde (Sigma-Aldrich) for 5 minutes at 37°C. The reaction was terminated by the addition of 10 µl of 1 M Tris-HCl (Sigma-Aldrich), pH 8.0. The protein samples were analyzed by electrophoresis in 12% polyacrylamide gels, and visualized with silver staining. Cultured HK2 cells were extracted in cell lysis buffer without Triton after treatment with IS and PCS at concentrations of 0, 1, 5, and 50 mg/L for 24 hours. The cell lysates were then treated with glutaraldehyde (Sigma-Aldrich) to facilitate protein cross-linking and were subjected to electrophoresis. The procedure for animal study was according to a previous report, with some modifications.3,30 In brief, 10-week-old B-6 mice subjected to half nephrectomy were used in this study. The experimental mice received intraperitoneal injection with IS (n=8) or PCS (n=8) at a dosage of 100 mg/kg per day for 1 week. The control mice (n=8) were administered daily with PBS injection for 1 week at similar volumes. For GW2974 treatment, the IS- and PCS-injected mice simultaneously administered GW2974 by the oral route at a dosage of 10 mg/kg per day for 1 week (n=8 for each group). At the end of the study, the renal cortex was microdissected for further analysis. All animal experiments were approved by the experimental animal ethics committee of the Chang Gung Memorial Hospital. Total protein was extracted using a commercial kit following the manufacturer’s instructions (Protein Extraction Kit; EMD Millipore, Billerica, MA). Thirty milligrams of protein from each sample was mixed with sample-loading buffer and loaded onto separate lanes in 12% SDS-polyacrylamide gel. Proteins were electrotransferred onto polyvinylidene fluoride membranes (0.2 mm, Immun-Blot; Bio-Rad), and then immunoblotted with antibodies against EGFR (Cell Signaling Technology, Denver, MA), EGFR-p (Tyr-1068; Cell Signaling), MMP2 (Abcam, Inc., Cambridge, MA), MMP9 (Abcam, Inc.), Stat1-p (Abcam, Inc.), Stat3-p (Abcam, Inc.), Erk1/2-p (Thr202/Tyr204; Cell Signaling Technology), Akt-p (Ser473; Cell Signaling Technology), β-catenin (Abcam, Inc.), β-catenin-p (Ser33/Ser37; Cell Signaling Technology), and β-actin (Abcam, Inc.). The intensity of each band was quantified using National Institutes of Health Image software (Bethesda, MD), and the densitometric intensity corresponding to each band was normalized with β-actin expression. For immunohistochemistry analysis, paraffin tissue sections were cut, mounted, deparaffinized, rehydrated, and stained with hematoxylin and eosin by using standard histologic techniques. The Ventana BenchMark automated staining system and Ventana reagents were used (Ventana Medical Systems, Tucson, AZ), and primary antibodies against MMP2/MMP9 (1:100 dilution; Abcam, Inc.) and β-catenin-p (Ser33/Ser37, 1:100 dilution; Cell Signaling Technology) at 4°C were used overnight. For immunofluorescence staining, cultured HK2 cells and serial cryostat sections of renal cortex were incubated with a primary rabbit antibody against EGFR (1:100 dilution; Cell Signaling Technology), EGFR-p (Tyr1068, 1:100 dilution; Cell Signaling Technology), and β-catenin-p (Ser33/Ser37, 1:100 dilution; Cell Signaling Technology). For renal tubule segment identification, frozen kidney samples were incubated with primary antibodies including FITC-conjugated anti-Lotus tetragonolobus lectin (1:500 dilution; Vector Laboratories, Burlingame, CA) and FITC-conjugated anti-Dolichosbiflorus agglutinin (1:500 dilution; Vector Laboratories).31 The sections were counterstained with 4′,6-diamidino-2-phenylindole (dilution 1:500; Sigma-Aldrich) to identify cellular nuclei. All data are expressed as the mean±SE. Data from different groups were compared using the Wilcoxon–Mann–Whitney test. P<0.05 was considered statistically significant. The authors thank the staff of the Medical Research Institute of Keelung Chang Gung Memorial Hospital for the experimental assistance. This study was supported by a grant from the Taiwan National Science Council (NMRPG2B6032). A portion of this work was presented at the 2013 Annual Meeting of the American Society of Nephrology, held November 5–10, 2013, in Atlanta, Georgia. This article contains supplemental material online at http://jasn.asnjournals.org/lookup/suppl/doi:10.1681/ASN.2014010021/-/DCSupplemental.